While the ultralight 11.6-inch X11 Carbon and 14-inch U2440/U2442 Ultrabook series have already been seen ahead of the Computex Trade Show, Gigabyte has revealed this week that the new notebooks will be coming in as many as five different models as seen in the image below. 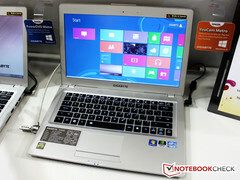 The U2440 Series aims to be a less expensive family of notebooks compared to the U2442 Series. Starting at 1.92 kg (4.23 pounds) with a height of 21.5 mm (0.846 inches), the U2440 notebooks will not be as compact but will start at a more affordable $700 price point. Those with deeper pockets can expect the U2442 notebooks to begin at a heftier $1000 to as much as $1300, according to MSI. Both lineups are expected to hit the European market by this July. In terms of internal components, the U2440N will sport An Intel Core i5-3317U, although other models will be using full voltage CPUs such as the i5-3120M. The U2442V in particular is expected to use the new ULV IVB i7-3517U with both integrated Intel HD 4000 graphics and an optional discrete Nvidia GT 630M or GT 640M graphics. 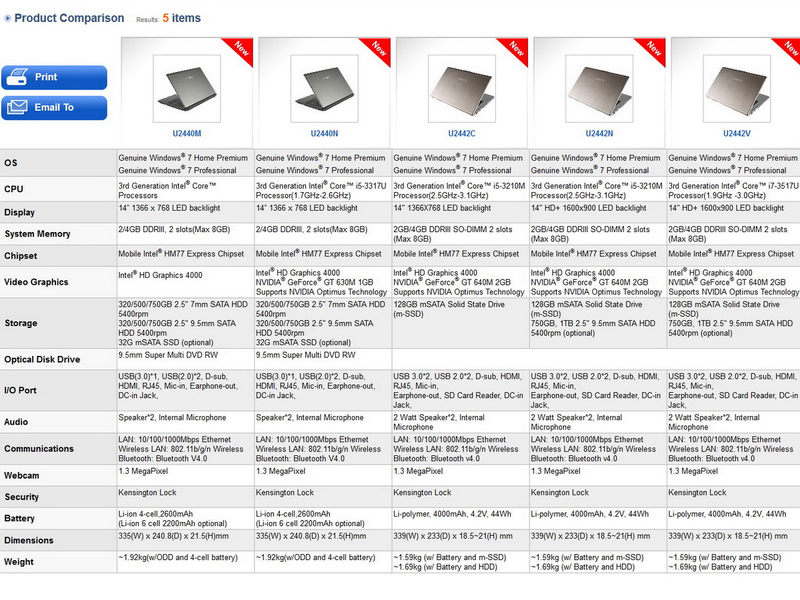 Models with a GeForce GT 650M will be available as well, but this higher spec'd unit is unconfirmed for a European launch. According to Gigabyte, the new Ultrabooks will employ a dual fan system despite the ultrathin form factor - one fan for the CPU and one fan for the GPU. Every model can be equipped with both an mSATA SSD (128GB versions available) and a 2.5-inch HDD. Display resolutions start at 1366x768 pixels, but certain models will support 1600x900 pixels as well. While the models appear to be sporting aluminum shells from afar, the cases are still "only" made of plastic upon closer inspection. However, the models do actually feel sturdier than many other notebooks with thin aluminum casings, at least based on first impressions. We covered the specifications of the X11 Carbon Book in a previous article, but we were able to get a quick hands-on impressions of the all-carbon fiber notebook at the show floor. If there was ever a notebook "as light as a feather", the 975 gram X11 definitely takes the cake. We did find a few nuances of the X11, however, that could prove to be annoying to some users. The glossy display, for example, may make outdoor use more difficult and is an absolute fingerprint magnet. Still, Gigabyte has managed to stuff in an ULV i5-3317U or i7-3517U, depending on the model. The X11 Carbon will make its debut in the U.S. this July starting for $1000. Not everyone will be on board for an 11.6-inch notebook starting at a grand, but the ultralight form will undoubtedly appeal to many users constantly on the move.